Regiment/Catrawd: 10th (Service) Battalion, South Wales Borderers. Service Rank and Number / Rheng gwasanaeth a rhif: Private No. 11490. Military Cemetery/Memorial / Fynwent milwrol: Cite Bonjean Military Cemetery, Armentieres. Ref No Grave or Memorial / Rhif cyfeirnod bedd: Plot: 11. Row: A. Grave: 3. Medals Awarded / Medalau a ddyfarnwyd: None. Executed by Firing Squad at 6. 40 am on Thursday 22nd November 1917 for desertion, aged 21 years. Thomas Henry Basil Rigby was born in Nabb, Shropshire, England in 1897. The 1901 Census shows that the family lived at 103 Worsley Road, Swinton, Nr. Manchester, Lancashire. The head of the family was John Henry Rigby aged 39, a Railway Carriage Cleaner. His wife Jane Rigby (nee Bate) and their son, Thomas Henry Basil Rigby aged 4 years. By 1911 the family had moved to 1 Bold View, Worsley Road, Swinton. Thomas who was now 14 years of age was employed as a Labourer on the local Tramways. On 23 February 1914 at the aged of 18 years he enlisted as a Regular Soldier with 10th Battalion, South Wales Borderers. On Tuesday 21 September 1915 he married Gladys May Lloyd Jones and some eight days later on Wednesday 29 September 1915 he was posted to the front in France. Nothing is known of his service in France and Flanders until 1917, when he was arrested for desertion. At about 3 pm on the afternoon of Tuesday 31 July 1917, when 10th (Service) Battalion, South Wales Borderers was at Kiel Cot (Old German Front Line), instructions were received that No1 Platoon was to supply four men to act as Brigade Runners. Four soldiers from the Platoon were detailed for this task, including Private Rigby. He was last seen by the other members of this unit at 11 am on Thursday 2 August 1917. At 11.20 am on Tuesday 7 August 1917, Lance Corporal Kirby of the Military Field Police was on duty in Boulevard Jacquard, Calais, when he had cause to stop and question Private Rigby. On being asked which unit he belonged to Rigby said, The King’s Liverpool Regiment. He was not in possession of a Pass authorising him to be in the town, he also had no shoulder or cap badges on show. He was therefore arrested and taken to Rue Leonard de Vinci Police Billet, Calais. When later interviewed Rigby gave his name as Private 28075 Thomas Lee, 19th Battalion, King’s Liverpool Regiment. He stated that he was from St. Martin’s Camp in Boulogne and had left there on Saturday 4 August 1917. He was not in possession of a Pay Book, Identity Discs or Regimental Badges. Not being satisfied with his explanation Rigby was detained at Fort Risban Guard House, Calais. When further interviewed he admitted that he had supplied false personal details, stating that he was in fact Private Harry Rigby of 10th (Service) Battalion, South Wales Borderers. He pleaded ‘Not Guilty’. Following the Prosecution case, Private Rigby elected not to give oral evidence but in stead supplied a written statement which read – Gentlemen. I was detailed by Sergeant Green at about 2.30 pm on 31 July 1917 as a Runner for Brigade. This was at Kiel Cot. I went to Brigade along with Private Johnson and six other men. The Corporal in charge was Corporal Watling, but he was wounded in the wrist before he arrived at Brigade Headquarters. I do not remember anything which happened to me after about 12 noon on 2 August until I came to my senses on the outskirts of a town called Watou on the 6 August. I made my way towards the railway where I saw a freight car, with not knowing which way the line ran. I thought the train was coming towards Poperinghe. Whilst in the train I fell asleep, and when I awoke the train was in a siding at Calais. I did not know that it was Calais at the time until I got into the town. I am sorry this has happened but I must have been partially mad at the time through worrying about my wife. I was married on the 21 September 1915 and sent out to the front on the 29th of the same month, and I have not seen my wife since. Gentlemen, I remain your honourable servant. Harry Rigby. The Court was informed that Private Rigby was under a suspended sentence of 3 years penal servitude for previous desertion. He was found guilty of desertion. The sentence of the court was that he suffer death by being shot. The sentence was carried out at 6.40 am on 22 November 1917. 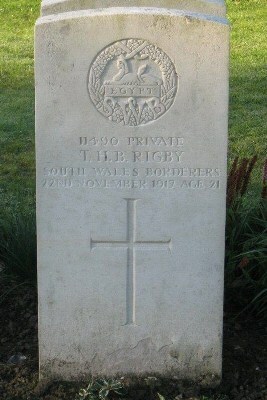 Headstone of Private 11490 Thomas Henry (Harry) Basil Rigby. In 2006, under Section 359 of the Armed Forces Act 2006, he was officially pardoned. The statement reads – ‘The pardon stands as recognition that Harry Rigby was one of the many victims of the First World War and that execution was not a fate he deserved’.